In the quest to unravel genetic aspects of flowering time regulation, quantitative trait loci (QTLs) are important data. QTLs indicate genome regions in which variation influences a trait of interest. Typically, a relatively large region of the genome is identified, and for practical purposes in breeding it might not always be needed to zoom in to the nucleotide level. However, for a better understanding of the molecular mechanisms involved in flowering time regulation, and for example, its role in domestication, knowledge of causal genes or nucleotides is clearly required. In a recent paper in Molecular Biology and Evolution, Liu et al. (2015) aimed to identify a causal gene underlying a flowering time QTL in sorghum. To get as close as possible to the causal variant underlying the QTL, fine-mapping was applied, using fine-spaced markers to delineate a small genome region within the original QTL. In the resulting 37-kb genome region, the authors observed that the gene HD1 (Heading Date 1) in one of the two parents of their population contains a frame-shift inducing deletion. HD1 is a very relevant gene, because homologs in rice and in Arabidopsis (CONSTANS, CO) are known to regulate flowering time. HD1/CO is a transcription factor, and transcription factors are known to be important players in domestication (see for example Meyer and Purugganan, 2013). The frameshift observed by Liu et al. lead to truncation of HD1. Such variant-of-large-effect is quite likely to lead to a dysfunctional protein. Although other types of functional changes are relevant during evolution, in particular cis-regulatory changes, mutations leading to null function appear to be the predominant type of causative change during domestication (Meyer and Purugganan, 2013). In addition to analyzing the genetic variation in HD1 in the context of their original QTL mapping population, Liu et al. added two additional types of evolutionary comparisons (Fig. 1). The first additional analysis focused on a set of sorghum varieties. In this population, the same truncating variation in HD1 as in the QTL study was found in some individuals, and an alternative deletion in HD1 was also identified. As a second step, additional crops were analyzed, in particular, rice and foxtail millet. In both species, a syntenic region containing HD1 can be identified. This region had previously been mapped as flowering time QTL in both species. 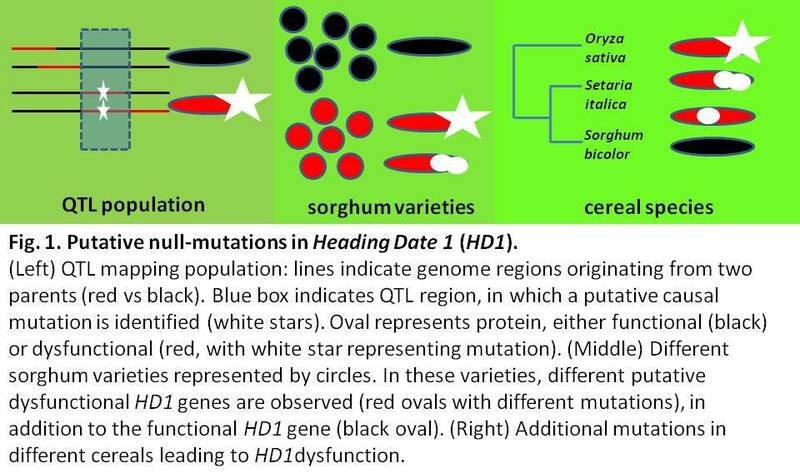 In rice, variants with a premature stop codon and with frameshifts are observed, which is somewhat reminiscent of the observed variation in HD1 in sorghum. In foxtail millet, however, the variation influences splicing leading to a deletion of 11 amino acids and again potential loss of HD1 function. As a general note, the selection of HD1 as a putative causal gene for the QTL by Liu et al. was possible because of available knowledge on HD1/CO function. For many genes, such knowledge is not available – and in fact, genes with yet unknown functions arguably would be the most valuable novel findings. We recently published a method aimed at prioritizing candidate genes underlying QTLs (Bargsten et al., 2014), which integrates sequence and expression information in order to predict gene functions. Subsequently, these predicted gene functions are used to rank genes for their likelihood to be causal genes involved in the trait-of-interest. Using this approach on a rice QTL compendium, a set of 79 genes with so far unknown function was identified as most likely candidates underlying variation in rice flowering time (Bargsten et al., 2014). The results presented by Liu et al. seem to indicate that variation in HD1 has been repeatedly selected for its effect on flowering time. In fact, an additional example is available: previously, QTL mapping suggested a variation in sorghum HD1 that consisted of a His to Tyr substitution (Yang et al., 2014). The same His to Tyr mutation inactivates the Arabidopsis HD1 homolog CO. Clearly, experimental proof of the hypothesized effects of the various genetic changes is needed. Nevertheless, the results presented by Liu et al. illustrate that for crop domestication, different roads lead to Rome: even though the genetic variation itself is not the same in the different species (deletion, splicing variation or coding change) in each case the effect presumably is that flowering time is affected. Bargsten JW, Nap JP, Sanchez-Perez GF, van Dijk ADJ. 2014. Prioritization of candidate genes in QTL regions based on associations between traits and biological processes. BMC Plant Biology 14: 330. Liu H, Liu H, Zhou L, Zhang Z, Zhang X, Wang M, Li H, Lin Z. 2015. Parallel domestication of the Heading Date 1 gene in cereals. Molecular Biology & Evolution 32(10): 2726-37. Meyer RS and Purugganan MD. 2013. Evolution of crop species: genetics of domestication and diversification. Nature Reviews Genetics 14: 840–852. Yang S, Weers BD, Morishige DT and Mullet JE. 2014. CONSTANS is a photoperiod regulated activator of flowering in sorghum. BMC Plant Biology, 14: 148. This entry was posted in flowering, Uncategorized and tagged Aalt-Jan van Dijk, domestication, flowering time, foxtail millet, gene function, Heading Date 1, QTL, rice, sorghum. Bookmark the permalink.